Successfully Added Guitar Tuner Keychain to your Shopping Cart. Guitar Tuner Keychain - time-saving and speedy tuning of your violin or guitar to any note, including sharps and flats, to make your music sound great. An excellent gift for both music lovers and professional musicians. Measuring less than 3 inches, the Guitar Tuner Keychain fits in the palm of your hand and allows guitarists and bass players to instantly tune most any note on their instrument. This tuner will work with your violin, viola, cello, banjo, mandolin and most other string instruments. It's also highly accurate and even identifies Sharp/Flat notes. 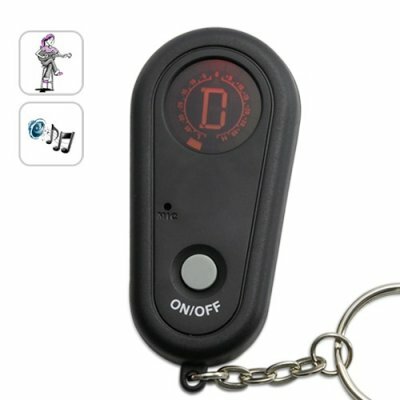 This is how it works: When you play your instrument, the internal microphone of the guitar tuner keychain will automatically identify the note and show it on the backlit LCD display. The display will also indicate by how much the note is in/out of tune and will change from red to green when you are in tune. Anyone can appreciate this convenient Guitar Tuner Keychain - Amateur guitarists, professional violinists, even plain old music lovers. This item is also a great choice for re-sellers and drop-shippers as the normal retail price of similar items costs over 5 times as much. Available in our warehouse right now, order today and we'll express ship it out tomorrow! Brought to you by the leader in China Electronics - Chinavasion. I have a string instrument that I can't even tell the name, will this Guitar Tuner Keychain work?